Nestled in the foothills of the Berber mountains and on the edge of the Atlantic ocean, the peaceful village of Tamraght is the perfect spot for a chilled and stress-free holiday. Blessed with views of the mountains and ocean, friendly locals and a thriving surf community, you're guaranteed an unforgettable surfing experience, rich in colour and culture. Located 14km from the city of Agadir and just next to the better known surf hub and fishing village of Taghazout, Tamraght offers a tranquil place to relax and unwind. Location is prime - just a short taxi ride to the hustle and bustle of Agadir city, good connections to Agadir airport and national bus services, and - most importantly - access to over 20 surf spots, suitable for all levels of surfer. Our NEW ocean-view Retreat Villa! ​Join us at our beautiful new retreat villa surrounded by nature, with uninterrupted views of the Atlas mountains and the Atlantic ocean. Our retreat villa offers the full Moroccan experience and an extra personal touch to your stay. With 8 guest rooms and space for up to 16 guests, it's perfect for solo travellers, couples, groups of friends and families, or a beautiful space to host your own retreat. All our rooms are decorated in traditional Moroccan style, with hand carved Berber wooden doors and furniture and blessed with views of the ocean and mountains. We have a selection of double, twin and single occupancy rooms, all with en-suite bathrooms and shower towels provided - and you're guaranteed a good night's sleep with our comfy beds and peaceful location. Using only fresh, seasonal and locally-sourced produce, our meals are packed full of flavour, colour and healthy goodness! All meals are prepared in a clean environment, with a variety of dishes and flavours to savour every day of your holiday. ​Enjoy a healthy, Moroccan breakfast every morning, with a selection of local breads, fruits, yoghurts, cereals, tea and coffee, readying you for your full day of surfing. Daily lunches are homemade and packed for you to take with you to the beach, so you never have to miss the best waves of the day! 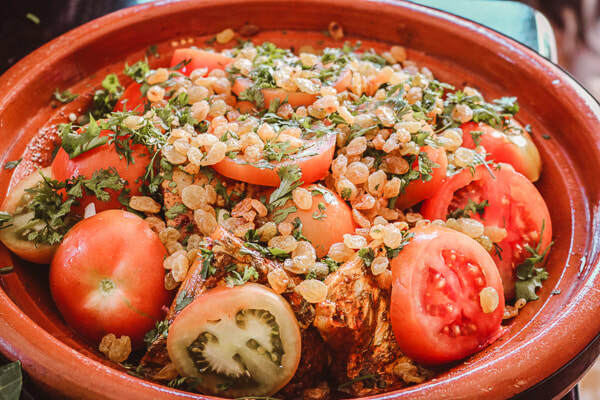 From sandwiches to hearty pasta pots, healthy salads, beach snacks and fresh fruit, we guarantee you'll be nice and full until dinner time, where you'll enjoy the taste of local and authentic Moroccan dishes that are bursting with flavour. Vegetarian, Vegan and special diets are also catered for - just let us know and we'll be happy to accommodate your needs! "I explored the surrounding region and visited some truly breathtaking sights. The food is amazing and fresh, featuring seafood dishes as well as traditional Moroccan meals. The village of Tamraght is perfectly located between bigger villages and offers a very peaceful environment. But if you want to experience a little night life it is only a 20 minute drive away. Access to affordable taxis or the local bus is easy and carefree."